When a media planning company kindly sent me a review copy of the self help book Rip it Up – as well as generously offering a second copy as competition prize – I was delighted. I love getting free stuff. However, I wasn’t really expecting to be particularly impressed when I read the book. After all, I’m an opinionated witch and rarely think anyone can offer me advice I don’t already know. How wrong I was. Rip It Up is not only very well written, in an engaging and entertaining style, it also offers extremely sound and easy to follow tips on things like how to be happy, how to improve your relationships, how to lose weight and how to gain confidence. 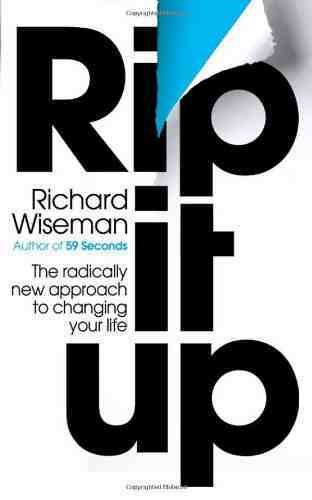 Richard Wiseman, who is the author of Rip it Up as well as being a professor of psychology at the University of Hertfordshire, suggests that if you want to change the way you feel, you need to change your behaviour rather than trying to alter your thoughts first. You don’t need to make big or difficult changes either. For example, if you have the blues, try forcing a smile onto your face even if you don’t really feel like it. Experiments have shown that just the act of smiling makes you feel a bit more cheerful. Other simple techniques include tensing your muscles to make you feel more confident, pushing an offered plate of cakes away from you to boost the resolve to stick to a diet and holding hands with your partner to make you feel more in love with them even if you have been going through a rough patch. The book’s title, Rip it Up, comes from the instructions to tear out certain pages of the book as you go along in order to perform practical exercises on them. The theory behind this seems to be that if you want to make big changes in your life but are hindered by your habits, the best way to become more flexible and break those habits is to deliberately do things in other areas of your life that you might not normally do, or might even consider taboo – like ripping up a book. To take part in the competition, all you have to do is answer this question: Which of the following does Rip It Up not offer to help with? Please email your answer to badwitch1234@gmail.com. The competition is open to anyone with a UK postal address, and don't forget to include that address on your email so Total Media will know where to send the book if you win. The closing date for the competition is the Monday 29 July 2013, at midnight. If you have any other comments or questions, do leave a comment below on this blog post.